A lot of people buy fish that grow too large for their aquariums. Most times it isn’t their fault as pet stores often don’t inform people how large their goldfish, oscar, or pleco will grow. A couple of years down the road, these massive fish can cause problems for unsuspecting aquarists. Some stores will take back overgrown fish and try to re-home them, but this is costly for the store. Many times these large pets are just released into local lakes and rivers because people assume just one fish won’t cause any harm. This leads to things like a pacu being caught in North Carolina and Utah. This is by no means good, but it isn’t the end of the world as most of these fish die when winter comes. But what happens when you get a cold-tolerant species like goldfish? Or when the winters just aren’t cold enough to kill off tropical fish like in southern Texas and Florida? If enough fish are released you can, and do, get breeding populations of these fish. This causes major problems for the local ecosystems. In the case of oscars (Astronotus ocellatus) suddenly local fish have to deal with a whole new predator. Those small fish are what feed the gamefish like bass and perch. The large predators of the lake suddenly have to deal with competition, something they might not have dealt with before. A lot of times, the new fish is a stronger competitor and drives the native fish towards extinction. In the case of goldfish (Carassius auratus auratus), they don’t directly compete with the native fish; it’s the feeding action of these fish that cause trouble. In the wild, goldfish quickly lose their gold coloring and look more like regular carp. Just like carp, they root around in the substrate. This causes the water to become cloudy, impeding the growth of plants in the substrate. These plants offer a refuge for juvenile native fishes; without them the juveniles become prey for larger fishes. The increased turbidity can also be a problem for fishes that feed on benthic insects as the insects rely on a layer of algae that cannot form when the water is cloudy. So far two species have suffered negative effects on wild populations since goldfish were introduced into their habitats: the Sacramento sucker Catostomus occidentalis (Moyle 1976) and Pahrump poolfish Empetrichthys latos latos (Deacon et al. 1964; Lee et al. 1980 et seq.) There may be many more that haven’t been studied yet. where they have been causing unrest in the local ecosystem. Not only are released aquarium fish a problem with the native fish, but they can be problematic for humans, too. Loricariid catfish, commonly called plecos, can’t survive the winters in the northern US, but they can and do thrive in the southernmost states. Florida, Texas, Louisiana, and Nevada all report breeding populations of these fish. These large catfish breed in burrows, which becomes a problem when they are found in high numbers. These burrows lead to increased erosion (Nico 2009). This can be very problematic when they burrow into levees as this causes the levees to erode from within. The damage may not be noticed until after the levee has breached. It’s not just freshwater fish that present a problem. Saltwater fish released into non-native habitats can also cause problems. The most notable is the lionfish (Pterois volitans). These are beautiful fish that outgrow most normal sized home aquariums and when released into the ocean survive and thrive. They have been reported as far north as Massachusetts and breeding populations are established from North Carolina to Florida, Bermuda, and all around the Caribbean. Lionfish are predatory and have a voracious appetite. They prey on important local fishes such as those that keep reefs clear of algae and juvenile foodfish that are economically important like grouper and grunts. Lionfish have no predators in the Caribbean ecosystem and are covered in large, venomous spines. These spines deter anything from eating them and cause harm to divers that approach them. Luckily there is something divers and fisheries managers can do about these fish: harvest them. They are targeted by spearfishing operations which appear to be having an impact on the population. It’s not just fish released from aquariums that can cause trouble; plants have also been known to make it into local waterways when aquarists toss them as well.. Some of the most notable examples of this come from floating plants like water hyacinth, hygrophila, water lettuce, and giant salvinia. These plants are rapid-growing and will choke out waterways making boat travel very difficult. Controlling them requires intensive management. 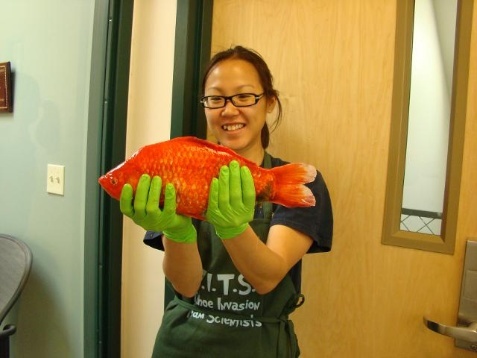 These are some of the worst cases of the consequences of aquarium release. I don’t want this to turn you against the aquarium hobby—I want these examples to open your eyes to what happens beyond your fish tanks. These examples are sad, and we can’t do anything to stop what they have already done. But we can prevent more examples from being added to this list. Never release fish from your aquarium into the wild. Never buy a fish you can’t house. Never expect someone else to take care of your fish when it gets larger. Speak up if you know someone who wants to release an aquarium fish. They may see it as just one fish, but they don’t know that hundreds of “just one fish” have already led to problems. We all can make a difference, and it starts with just one fish. Deacon, J.E., C. Hubbs, and B.J. Zahuranec. 1964. Some effects of introduced fishes on the native fish fauna of southern Nevada. Copeia 1964(2):384-388. Leo Nico, Pam Fuller, and Matt Neilson. 2013. 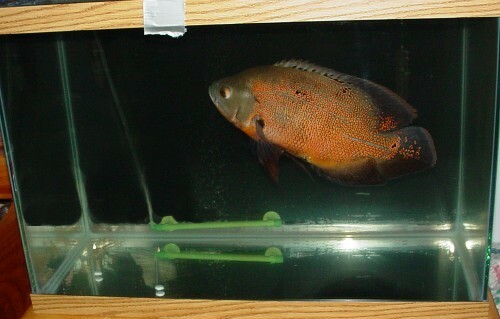 Astronotus ocellatus. USGS Nonindigenous Aquatic Species Database, Gainesville, FL. nas.er.usgs.gov/ Updated: 4 March 2013. Retrieved: 28 March 2013. "Lionfish Pterois volitans." Florida Fish and Wildlife Conservation Commission. http://myfwc.com/wildlifehabitats/nonnatives. Updated: 2013. Retrieved: 28 March 2013. "Lionfish Research Program." REEF. www.reef.org. Updated: 2012. Retrieved 28 March 2013. Nico, Leo G., Howard L Jelks, Travis Tuten. 2009. Non-Nativev Suckermouth Armored Catfishes in Florida: Description of Nest Burrows and Burrow Colonies with Assessment of Shoreline Conditions. Aquatic Nuisance Species Research Program 09: 1-29. Nico, L.G., P.J. Schofield, J. Larson, and A. Fusaro. 2013. Carassius auratus. USGS Nonindigenous Aquatic Species Database, Gainesville, FL. nas.er.usgs.gov/ Updated: 4 Jan 2012. Retrieved: 27 March 2013. "Piranha-like fish caught in Utah Lake was a Pacu." The Salt Lake Tribune. www.sltrib.com. Updated: 21 July 2006. Retrieved 27 March 2013. Taylor, Fred. 27 Sept 2006. "Wild life experts don't bite on tale of piranha in Lake Gaston." WRAL News. www.wral.com. Retrieved: 28 March 2013.